If you are out there... if anyone is out there... I can provide food, I can provide shelter, I can provide security. If there's anybody out there... anybody... please. You are not alone. I've not read Matheson's novel, but from what I know about it I can understand the position of those who are furious at this version. On its own terms, however, this is an effective apocalyptic tale, economically told and with an affecting performance from Smith (ironically, as this is the most expensive end of the world/zombie tale of recent years, it has the one thing all those others lack, a protagonist you empathise with). 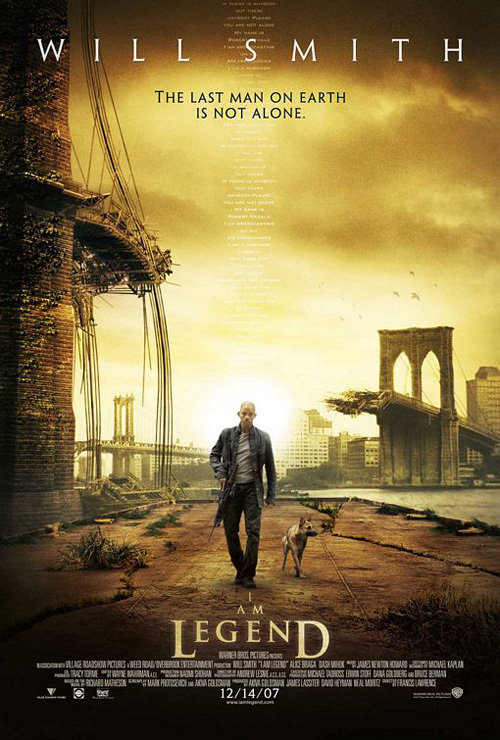 On repeat viewing the CGI is no more acceptable, but what is good is very good; Smith's mental deterioration, his relationship with his faithful hound and a superb set piece with Smith suspended above a street as dusk encroaches. Bizarrely, there's an alternate ending on the second DVD - but with the entire rest of the film attached! Thematically it sounds like it has more in common with the novel, but the result of that is that it completely doesn't work in this telling of the story. Interesting, though.